Following Dr. Holub’s lecture to research physician investigators, Dr. Holub took time to pose with Dr. Claude Wischik (center), founder of TauRx Pharmaceuticals, who has spent 30 years developing potential treatments for Alzheimer’s Disease. Dr. Holub has been involved in clinical research for over 25 years and has completed over 110 clinical trials for the development of memory disorder medications. He has participated in the clinical trials that lead to the approval of all five FDA approved medications, as well as the first amyloid imaging agent, the Avid drug Florbetapir. Currently, Dr. Holub is working with several research protocols directed toward the Tau protein, which is felt to be involved in the pathological process of Alzheimer’s disease and other dementias. 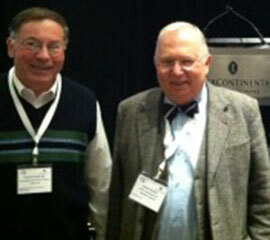 On January 19, 2013, Dr. Holub was asked to speak at the investigators’ meeting in Chicago. Specifically, he was asked to present the nature and the character of the protocol, as it relates to its practical applications by the physician investigators involved in this trial. He was therefore asked to evaluate a number of patients via the protocol prior to the investigator meeting, identify the “ins and outs” that physician investigators would need to be mindful of in order to smoothly and effectively execute the protocol. His discussions were so well received that Dr. Holub was asked to present similar discussions at a second conference in the Autumn of 2013. He was later asked to lecture to and meet with six sites in Russia in February of 2014 in order to clarify the “ins and outs” of the research protocol and to answer any questions that the newly added Russian sites might have so that they could more expeditiously begin their involvement with these trials. Dr. Holub is frequently asked for his opinion with reference to the nature and character of various research protocols.